Home / News / Bitcoin vs Gold: Time to Invest in Something Tangible? Bitcoin vs Gold: Time to Invest in Something Tangible? Cryptocurrencies have taken the world by storm. In the same way as the dotcom industry blew up in the mid-nineties, this new and exciting investment opportunity had many traders selling up their existing assets to get in on the ground floor of a brand-new medium. However, when looking at precious metals vs cryptocurrency as investment opportunities, it is wise to be mindful of bitcoin’s volatility. In a similar way to the dotcom bubble, a number of leaders within the industry believe the crypto bubble is likely to burst. We will be looking at the standard model for cryptocurrencies which is bitcoin. Although there are now hundreds of altcoins available, we will be comparing the original crypto against the most popular precious metal: gold. For many investors, the lack of certainty around virtual currencies like bitcoin will influence more purchases of tangible assets, like gold and silver. Although bitcoin was designed to replicate some of the investment benefits of gold, its lack of a central system of governance and inability to be properly insured gives it less credence as part of your investment portfolio. In spite of its enormous popularity over the past year, there are problems with cryptocurrency as an asset. Bitcoin was the first cryptocurrency, created by anonymous programmer Satoshi Nakamoto. Although Nakamoto has never been properly identified, many believe him to be a single person who was responsible for creating and building the blockchain ledger, which is the foundation upon which all bitcoin transactions are created. Bitcoins themselves are mined by powerful computers and act as rewards given to those computers for solving a highly-technical mathematical puzzle. It is an initially confusing concept, leading many to question how a virtual currency that is not attached to any system of governance can possibly be legal or safe. Although its reputation has moved on considerably since its days as the dark web’s main currency, it lacks official ownership by definition, and this means it is under-regulated and uninsurable. Not only that, but as it is a new medium for investment, there are a few extremely powerful players that can influence the market at the drop of a hat. Coupled with an influx of investors who do not have deep knowledge of crypto as an asset, the whole market is in constant flux, leading to instability and fluctuation. Gold vs Cryptocurrency: Which is the Better Investment? For some people, the excitement of investing in an unpredictable market is a bonus, however for many it can be a stressful experience. This is why gold and bitcoin are so different. Although the initial design of bitcoin was to replicate the positives of gold, they have grown apart to the extent that they now sit on opposite sides of the spectrum. Gold is and always will be one of the most invested-in assets in the world. Its value is maintained due to the fact that it is finite, and there will only ever be a certain amount mined. It is relatively simple to forge into coins and cannot be destroyed by nature or the passage of time, which is why archaeologists are still finding stunningly intricate gold coins to this day. It also has a rich history which still influences its reputation. Its connection to ancient kingdoms and history’s most rich and powerful leaders has given it a credibility that will no doubt stay with it forever. In opposition, bitcoin and other cryptocurrencies are still somewhat associated with confusion and a lack of authority. Although this was their intended purpose, not having money affiliated with a bank or financial authority breeds disconcertion among investors. Having said that, bitcoin does share some properties with gold. It is also finite, with a limit of 21million coins allowed to be mined, which will influence its value going forward. Are you looking for a long- or short-term investment? Bitcoin (and other altcoins) are often perceived as a short-term investment because the prices change quite rapidly. It is possible to buy and sell quickly, although many choose to utilise techniques such as binary options, day trading and leverage trading to maximise their profits. If you actually own the cryptocurrency you are trading with, you are likely to see it fluctuate considerably, making it a good choice for some investors but a questionable one for those who are inexperienced.Gold on the other hand is a long-term investment and is often seen as a way to insure oneself against any political or sociological influences that would affect the state of specific currencies or stocks. For example, the US dollar fell in value between 1998 and 2008, which led many to invest in gold instead, thus tripling the price of gold. In the same vein, gold will retain its value during times of deflation as well, and is known as a ‘crisis commodity’ because it continues to be regarded as a safe and sound investment during times of instability. Although the price of gold fluctuates in the short-term, over an extended period of time it remains safe. There are many reasons why people choose to invest, and what you choose to invest in will depend on these reasons. Perhaps you want to purchase a gold coin as a wedding or christening gift. Or maybe you are looking to invest in a large amount of gold as part of your retirement fund. For lovers of cryptocurrency, the likelihood is they are investing for investment’s sake. For example, gold has many real-world uses, can be easily forged, and is recognised almost everywhere as a tangible currency. However, the current state of bitcoin means it has little use outside of being a vehicle for investment. This makes it a good choice for those looking to grow their experience of investment and trading, but not for those looking to hold it as a spendable currency. Whilst there are many companies looking to take bitcoin as payment in the future, they are few and far between at the moment. Investing in precious metals will afford you greater security than bitcoin and other cryptocurrencies. Although it is purported to be safe, there have been numerous hacks to cryptocurrency networks, and its lack of a central power make it hard to insure. Japan-based company Mt.Gox were forced into bankruptcy after they were hacked for $500 million bitcoin; they were unable to pay anyone back for their losses. Similarly, South Korean company NiceHash had over $63million in bitcoin stolen and were forced to shut down the very next day. Again, no one was paid back for their losses. Whilst this is not always the case (CoinCheck, based in Japan, was hacked for an enormous £530million, but managed to pay back all investors out of their own pockets within two days), the uncertainty surrounding crypto does not seem to be waning. On the contrary, gold can be protected by insurance which will pay you back the value if it is stolen. If you choose to hold your gold in a dedicated vault or safety deposit box, it will be protected under their policy. Essentially, there is much more stability in terms or recouping losses. Gold, as one of the most precious elements in the world, still holds a solid reputation. 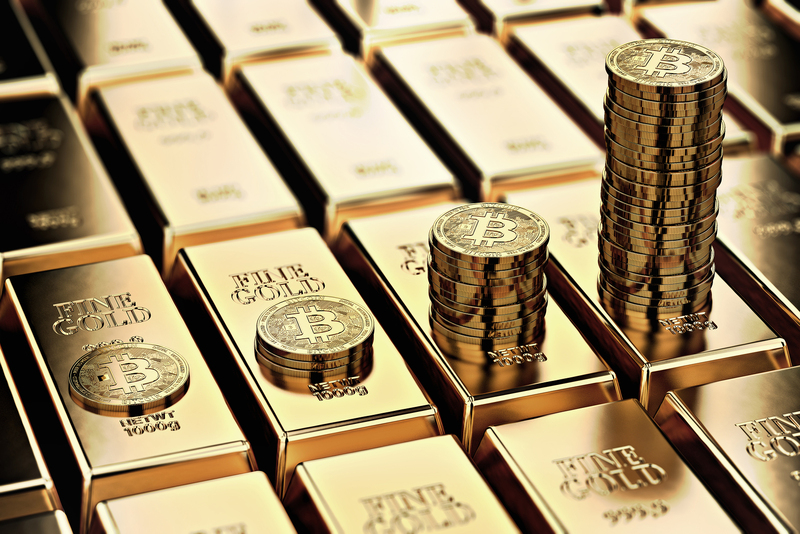 Its value has increased exponentially over the past ten years, and with many people discovering the pitfalls of investing in virtual currencies, the tangible nature of gold makes it more valuable than ever.